Board the Birdwell Island ferry and journey to the world of Clifford™, America’s beloved big red dog with a heart to match in Adventures with Clifford The Big Red Dog™ See Emily Elizabeth™ and many of the residents of Birdwell Island. Inspired by Scholastic Entertainment’s TV show Clifford The Big Red Dog™ on PBS KIDS®, the exhibit offers numerous immersive “paws-on” adventures that reinforce “Clifford’s Big Ideas”—ten simple tangible life lessons designed to help young children navigate their world: Share, Play Fair, Have Respect, Work Together, Be Responsible, Be Truthful, Be Kind, Believe in Yourself, Be a Good Friend and Help Others. Meet and Greet Clifford the Big Red Dog on Sundays. Review FAQs for dates and times. Want to meet Clifford the Big Red Dog every weekend? Become a member today to enjoy unlimited free museum admission. Welcome to Birdwell Island, the home of Clifford and his owner, Emily Elizabeth Howard. Clifford was the runt of the litter when Emily Elizabeth adopted him. Much to everyone’s surprise, Clifford outgrew all the other dogs because of Emily Elizabeth’s limitless love. So, the Howards left the city and moved to Birdwell Island, where they made new friends, including Cleo, T-Bone and Mac. Visitors enter Adventures with Clifford The Big Red Dog by passing Birdwell Island’s lighthouse and board the ferry. Children and adults can join “Victor” and “Pedro” in the pilot house and try their hand at “steering” the ferry. Visitors hear the sounds of seagulls and ocean waves roaring as they navigate their way to Birdwell Island with the help of a three-dimensional map of the island. Children can move “tourists” around the map and visit Samuel’s Restaurant, the Post Office, Cleo’s Backyard, and all of Clifford’s favorite places on the Island. Say “hello!” to “Samuel” and his son “Charley,” pull up a stool at Samuel’s Fish and Chips Shack on the pier, and place your order (maybe Samuel’s delicious fish and chips!). Children and adults can enter Samuel’s Shack and role-play restaurant employees working together to restock the shelves, cook, clean, and serve. Kids can grab an order pad, take their family and friends orders and total their bill at the cash register. No island is complete without a beach! “T-Bone” welcomes children and adults to a bone-shaped “beach” where kids can follow Clifford’s Big Ideas and “Play Fair” by taking turns hunting for seashells. A nine-foot Clifford greets visitors in his backyard outside his doghouse. Children can take a seat next to Emily Elizabeth on the giant paws of her big red best friend and slide down Clifford’s tail. Kids can “Be Responsible” by helping fill Clifford’s giant dog bowl using a bone-shaped conveyor belt to keep the crimson canine’s giant dog bowl full of bones. 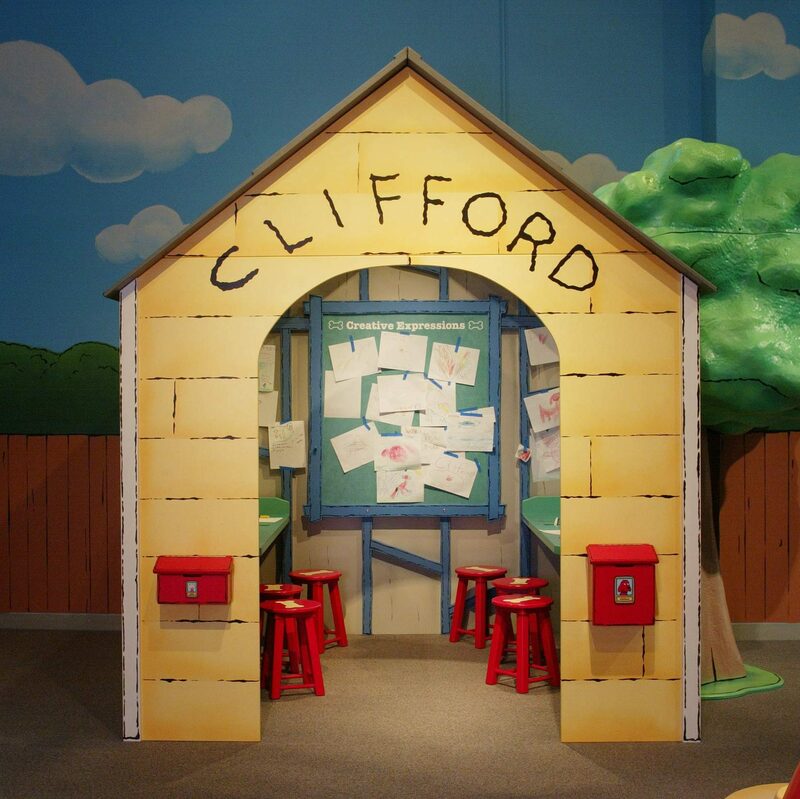 Inside Clifford’s Doghouse, fans can create pictures, invitations, letters and more using paper, crayons, pencils and other supplies. They can display their masterpieces in the doghouse, mail them to an Island resident or take them home and bring a smile to a family member or friend. “Mac” invites visitors to take the stage with Clifford and his pals in Emily Elizabeth’s Backyard Theater. Dressed in Cleo, T-Bone or Clifford costumes, they can get “red”dy to be the best in show. Kids can perform for family and friends sitting in the audience on bone-shaped benches. Young children use their imagination to create their own performance using maracas and drums. Children and adults can visit The Howard’s house, complete with garage. In the front of the house, kids can pick, sort and replant flowers in a flower box. Fans can “Be a Good Friend” to Emily Elizabeth and Clifford by using lawn tools, watering cans and lawn mower to spiff-up the backyard. Adventures with Clifford The Big Red Dog’s youngest visitors will dig Cleo’s Backyard, designed especially for tots with a soft floor and “stone” wall enclosure. 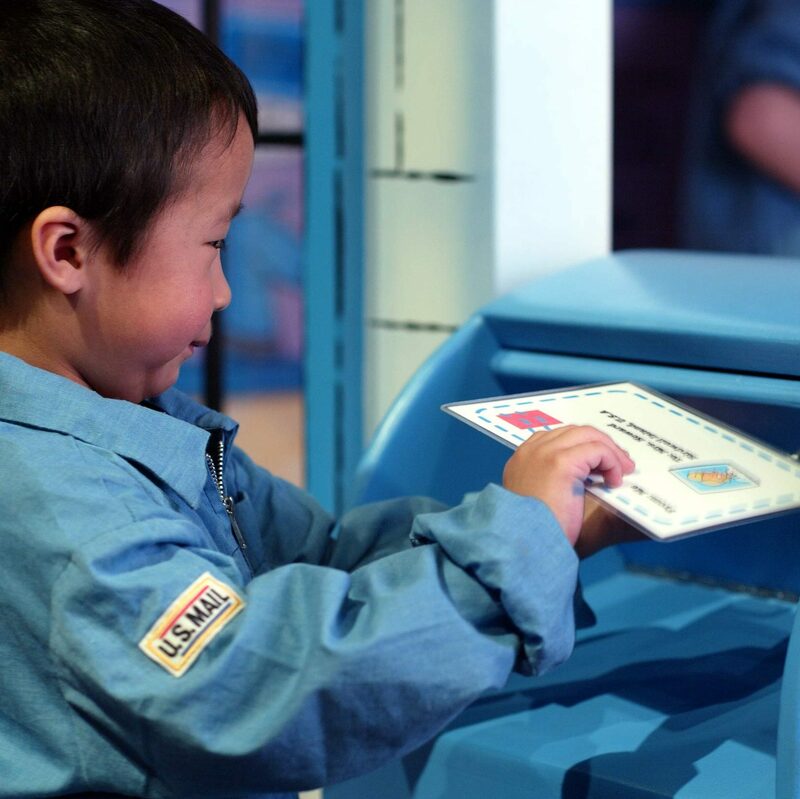 “Cleo” encourages toddlers to crawl through a tunnel, or play a shape-sorting activity at Cleo’s doghouse. 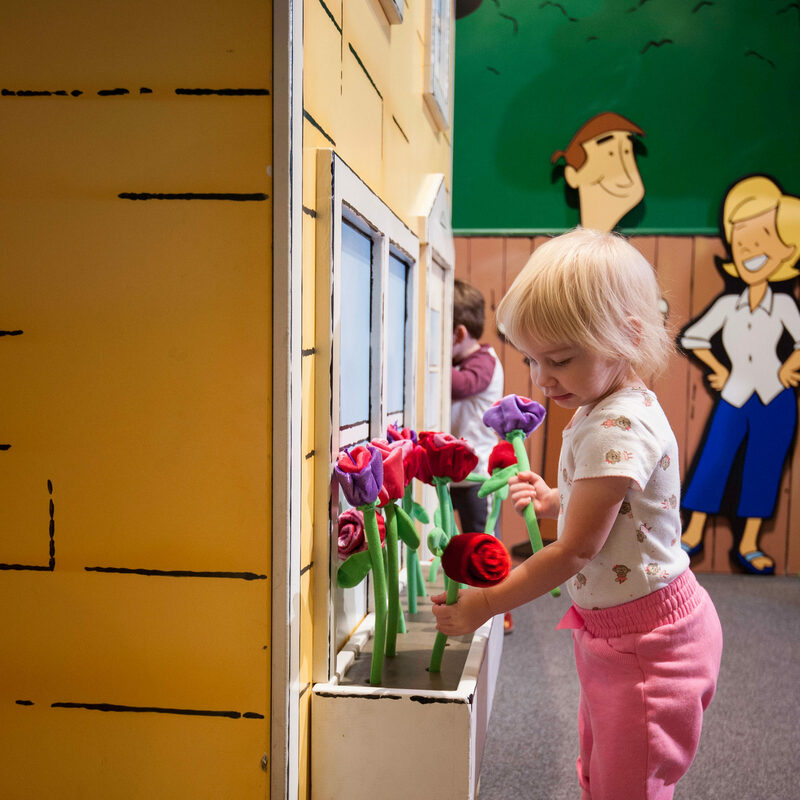 At the “stone” wall, kids can enjoy activities as they open the doors to T-Bone’s doghouse, and are greeted by their reflection in a mirror; turn a crank to make Clifford go in and out of his doghouse; and spin two tumblers to match Birdwell Island characters to their home. Children can join “Mr. Carson” at the Birdwell Island Post Office, and help sort and mail letters. Then they can deliver mail and pictures to the Birdwell Island residents’ mailboxes. Take a break from all the action and cozy-up for a reading adventure. “Ms. Lee” welcomes visitors to the library, host to a collection of Clifford books. Children can practice believing in themselves and building confidence (just like Clifford!) as they share Clifford stories and play games. At the Norman Bridwell Art Retrospective, “Jetta” invites visitors to view clips from an interview with Norman Bridwell. Children and adults can also browse artwork and get an inside look at Clifford’s character and story development during the past 50 years. Adventures with Clifford The Big Red Dog was created by Minnesota Children’s Museum in partnership with Scholastic Entertainment, Inc. ©2017 Scholastic and logos are trademarks of Scholastic Entertainment, Inc. CLIFFORD, EMILY ELIZABETH, CLIFFORD THE BIG RED DOG and logos are trademarks of Norman Bridwell. All rights reserved. 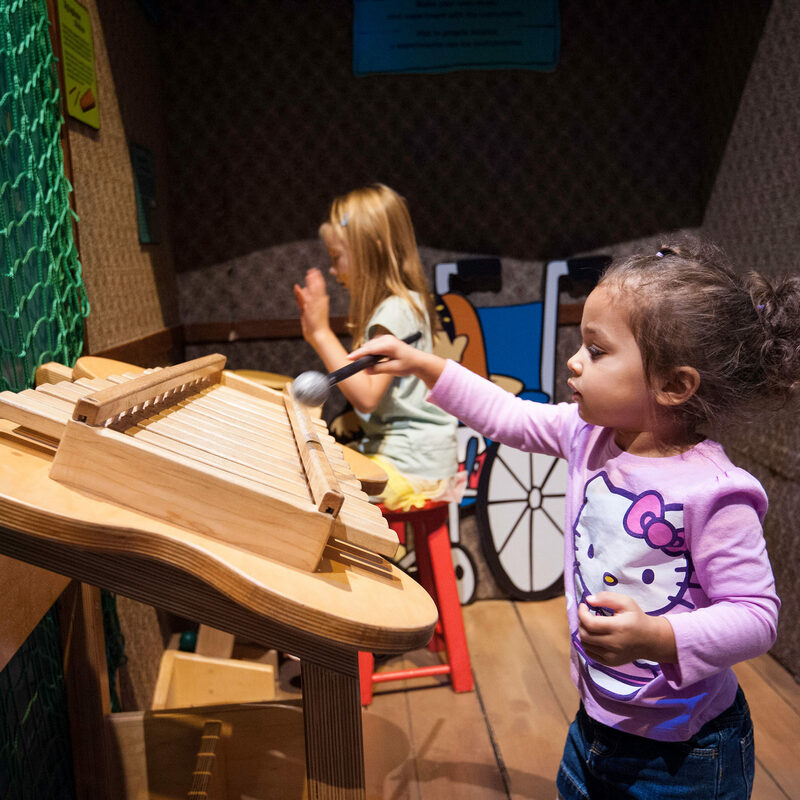 Photo Credit: Adventures with Clifford The Big Red Dog™ was created by Minnesota Children’s Museum together with Scholastic Entertainment. © 2016 Scholastic Entertainment Inc. SCHOLASTIC and logos are trademarks of Scholastic Inc. CLIFFORD, EMILY ELIZABETH, CLIFFORD THE BIG RED DOG, BE BIG and logos are trademarks of Norman Birdwell. All rights reserved.